In 2016, I launched a new website designed by Patrick Smith of CODEIT DESIGN. I’ve known Patrick for a few years now and worked with him on some of CODEIT’s marketing programs. He has developed a true niche working with many acclaimed photographers in the design and on-going maintenance of their sites. This includes custom branding for each client – that’s apparent if you check out the CODEIT DESIGN site and their client sites. Patrick is easy to work with and I believe the end product delivered is well branded and effective. I asked Patrick a few questions that may be of interest to those looking to launch or redesign a website. How did you begin working with photographers? Like a lot of things in life, it was a matter of circumstance with a touch of serendipity. Beginning in ‘02/’03, I was working almost exclusively on real estate agency and individual broker websites. With the growth of technology, I saw an opportunity to add panoramic photography as a service offering to my existing real estate clients. Through this I discovered my passion for photography and began venturing out into nature. These hikes led to my meeting and becoming friends with a few, well established, successful, landscape photographers. When the mortgage crisis occurred, and I began to see my existing clients close their doors, it was a natural transition for me to apply my passion and expertise to the photographic marketplace. What tips/advice do you have on websites for photographers who are just starting their business? This advice both relates to the post-processing workflow, and the resulting consequence it has on a photographer’s website. Simply put, develop a consistent and thorough cataloging and file naming system. In addition, put in the extra time to properly complete the IPTC metadata – headline, title, caption, and keyword set for each image. Doing this on an image-by-image basis, as a part of your post-processing workflow, is far easier than returning to several hundred, or even, several thousand images at a later date and awakening to a daunting task. Complete IPTC metadata is critical to having images recognized and ranked in popular search engines, such as Google. Furthermore, it enhances the likelihood that users who visit your site will receive comprehensive, accurate search results. Your sites are so well branded. Where do you get your inspiration? My inspiration comes from my clients, themselves. I firmly believe that one of the most important aspects to the design process is getting to know a client and their audience. This insight often comes through in our first couple of conversations. I also request a list of sites with appealing elements annotated. Inevitably, there are common elements between these sites that are not recognized by the client. These common elements are used along with the information they have provided about their audience and what I have gleaned from our conversations to develop a brand identity. This process of listening, learning and applying over a decades worth of industry experience is at the heart of my brand development philosophy. What is something that you see or experience with websites that really bothers you? Ideally a website for a photographer/artist? What irks me? The thing that gets to me most is to see an artist or photographer who has a very obvious, strong talent whose website does not reflect that talent, either through an attempt to create the site themselves, or worse, poor direction and / or lack of effort from another company. If you could offer one tip as folks go back and review their sites – what would it be? Consistency and symmetry – This applies to section headings, paragraph text, image display, image size, etc. As an example, if one has capitalized the first letter of each word in most of their section headings, but deviated from that pattern somewhere along the way, it portrays a lack of thoroughness and professionalism that will easily put-off a user. Once a user has a bad taste, they are gone – no question. With that scenario out there, please let me emphasize, that is an extreme example of error. Users are highly unlikely to consciously spend time analyzing the various elements of your site. Rather, they are making judgments as to whether or not they trust you and if you can provide what they want in less time than it takes to blink your eyes, quite literally. According to published studies, the attention span of the average American is less than that of a goldfish, 9 seconds. I cannot emphasize enough, you best convey your brand, who you are, what you offer and that you can be trusted in the blink of an eye. What percentage of your clients use social media regularly? I estimate 75% of my clients use social media regularly. Social media can be a very effective marketing tool. I encourage clients to just get started – use a platform – don’t be intimidated by the technology. As they gain more confidence, integrate it into their routines and become comfortable, the effectiveness of their efforts is quickly apparent. In addition to offering SM consultations, we manage SM campaigns for a number of photographers on our client list who do extensive travel and / or desire our expertise. Patrick – thank you for your time and insight into website design and functionality. I appreciate your knowledge and your close association with the photography and creative markets. Plus, you tell it like it is and that’s helpful. 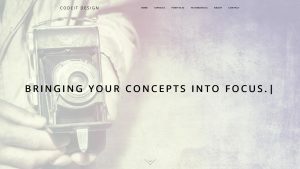 Learn more about CODEIT DESIGN at www.CodeItDesign.com.